ATHOL, Idaho (AP) — Authorities say a worker at a northern Idaho lumber mill died in an industrial accident on Friday. The Kootenai County Sheriff’s office says the 45-year-old man was fatally injured while trying to clear a broken piece of wood from a machine at the Merritt Brothers Lumber Company in Athol. The man’s name was not released is 45-year-old Robert J. Billingsley. WEST EARL TOWNSHIP, LANCASTER COUNTY, Pa.–Authorities have identified a tow truck operator and the driver of a disabled vehicle who were struck and killed by another vehicle in Lancaster County early Sunday morning. The crash happened around 1:50 a.m. in the northbound lanes of Route 222, near the Peach Road overpass in West Earl Township. The AAA tow truck operator identified as Ralph H. Watrous II, 44, of Elizabethtown, was removing a disabled vehicle, owned by Robert M. Buckwalter Jr., 46, of Ephrata. Police say a northbound vehicle driven by Anthony Caldwell, of Stafford, Virginia hit both Watrous and Buckwalter as they were standing outside the tow truck. Both men were pronounced dead at the scene. Atlanta, GA — The man who died at a Midtown construction site Friday was working on a 12-story Northside Hospital building when a piece of construction equipment fell on him.The worker was identified Saturday as Luis De Leon Jr., 20, of Rex, an unincorporated community in Clayton County, according to the Fulton County Medical Examiner’s office. Columbia, SC (WLTX) – The City of Columbia says one of their employees died while trying to help with the city’s response during Hurricane Irma Monday. The city confirmed that Assistant Superintendent Arthur D. Strudwick, 48, was injured in a car accident on his way to a downed tree. Strudwick was taken to the hospital where he later died. TAMPA, Fla. — A Florida man cleaning up debris after Hurricane Irma was killed after his chainsaw got tangled on a tree branch. Wilfredo Hernandez, 55, was killed around 6 p.m. Monday, FOX 13 reports. Hernandez had been cleaning debris on his property when he climbed a tree to cut down some branches. While cutting, his chainsaw became jammed and forced the power tool toward him. The chainsaw kicked up and cut Hernandez’s carotid artery. LANSING, Mich. (AP) – (9/16/17) – An electrician from the Lansing-area was electrocuted while working a job in Ohio. The Lansing State Journal reports 19-year-old Nathan Norris was pronounced dead Friday at Mercy Health St. Vincent Medical Center in Toledo. Norris was an electrician for a company called Ac-Dc Electrical Contractors. He lived in Delhi Township, outside Lansing. Officials say Norris was stringing up cable when he touched a live wire that knocked him out of a bucket truck and into a tree. BALTIMORE (WJZ) — A construction worker was killed instantly after he was hit in the head with a crane holding 13,000 pounds of cement in Harbor East Friday morning. It happened around 7:30 a.m. in the area of Aliceanna Street and South Central Avenue, Baltimore Police tell WJZ. Fontana, CA — A Murrieta resident died when a large tractor ran him over during a road-construction project in Fontana on Wednesday, Sept. 13, police said. Eduardo Perez Gonzalez, 51, of Murrieta, was killed in the 2 p.m. accident, according to the San Bernardino County Coroner’s Office. MOUNT LAUREL, NJ — Police have identified the truck driver who died in a crash Thursday night after his vehicle veered off the roadway. Joseph Malta, 36, of Jackson, was traveling north on I-295 around 7:30 p.m. when his truck left the road and collided with a highway sign, Trooper Alejandro Goez, a state police spokesman, said. HASKELL COUNTY, Kan. (KWCH) The Haskell County Sheriff’s Office says one man was killed in a grain elevator accident on Thursday. They say a call was placed to 911 around 3:31 p.m. An employee for the ADM (Archer Daniels Midland) facility located at 1892 U.S. Highway 83 in Haskell County was trapped in a grain elevator. Units on scene determined that two ADM employees were in a grain silo trying to remove a third employee who was entrapped in grain within the silo but their efforts to remove the person were unsuccessful. Around 6 p.m., 25-year-old Javier Trejo, of Liberal, was pronounced dead at the scene. Troy, MI — A 39-year-old Canton Township, Mich. construction worker was fatally injured Wednesday, Sept. 13 after a portable saw struck him in the neck, according to news reports. The worker, whose name and employer have not been released, was removing an in-ground pool at a property in Troy, Mich. when he lost control of the equipment after it became stuck. He was one of two employees at the job site. MCCLAIN COUNTY, Okla. (KOKH) — A truck driver dead in a fiery crash along I-44 in McClain County has been identified. The Oklahoma Highway Patrol reports that just before 8 a.m. Sept. 14 a 2016 Freightliner driven by 27-year-old Freedom Kinnaman, of Norman, was driving south of Tuttle on I-44 near mile marker 100 when his vehicle departed the roadway to the right. The vehicle then over-corrected to the left, hit a guard rail and rolled down an embankment. Kinnaman was pinned inside the vehicle as it set on fire and was later pronounced dead. CASTRO VALLEY, CA – All lanes of westbound Interstate Highway 580 have reopened this afternoon after a pair of big-rig collisions that turned fatal and blocked traffic for nearly 10 hours near Castro Valley in unincorporated Alameda County. A black sedan collided with a big-rig, affecting the driver’s ability to steer the vehicle. The first big-rig came to rest in the middle of the freeway and was subsequently struck by a second big-rig, CHP Officer Tyler Hahn said.The man driving the second big-rig died as a result of the collision, according to Hahn. He’s been identified as 62-year-old Maclovio Lopez of Roseville, according to the Alameda County coroner’s bureau. KNOX COUNTY, TN – A worker died while on the job along Alcoa Highway Wednesday afternoon, according to the Tennessee Department of Labor. Details about what led to or caused the worker’s death were not immediately available, but state officials said it happened in the acceleration lane of the intersection at Alcoa Highway and Maloney Road in Knox County. The agency notified Tennessee OSHA, and an inspector arrived on the scene around 3:30 p.m. A TDOT spokesperson told WBIR the worker was employed with a subcontractor called Stansell Electric. NORTH PLATTE, Neb. — Authorities say a worker died in an accident at a potato farm south of North Platte on Tuesday morning. Lincoln County Sheriff’s Lt. Dan Newton said the worker got caught up in moving belt parts of some farm machinery and suffered fatal injuries. He was identified as Lloyd Behrens, 57, of North Platte. 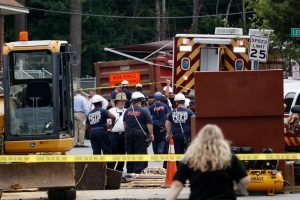 MOBILE, Ala. — OSHA is investigating after a employee died from a trench collapse at a local plant nursery. It happened around 11:30 a.m. morning at Flowerwood Nursery in Mobile. A Mobile Fire-Rescue spokesperson says when they arrived on scene the employee was unconscious and trapped about waist deep inside a hole. Officials say workers were digging a trench to lay water lines when it collapsed in on one of the workers burying him in the dirt. Neither the company nor Mobile Police has released the name of the victims. NASHVILLE, TN – A freak accident appears to be to blame for a man’s death Tuesday morning in west Nashville. The incident happened at the YRC Freight building on Centennial Boulevard around 1:30 a.m. According to police, an employee was hit by machinery that’s used to move trailers. He was taken to Vanderbilt University Medical Center, where he later died.